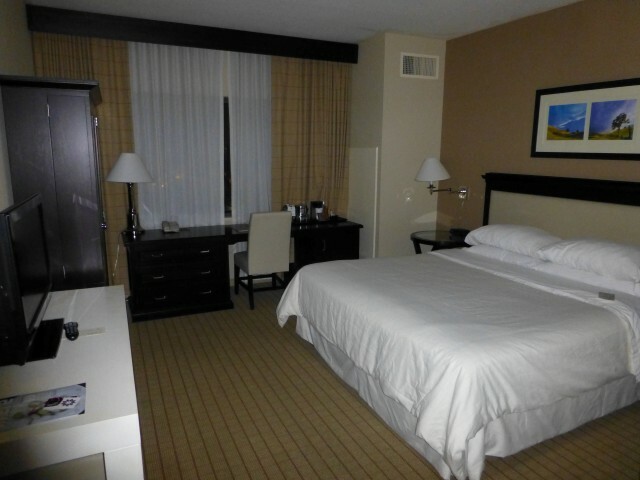 My second night in my Starwood (@SPG) Hotel Hopping adventure was at the Sheraton Garden Grove. This hotel was less than a mile from my hotel the night before – the Sheraton Park Hotel. Again, like the previous night, I checked in around midnight. As before, I was staying just a single night and the folks at check-in didn’t bother to tell me about the amenities or ancillary services the hotel offers. With less than 7 hours on property again, there really was no need. This time I was given a king room, as requested. Unfortunately it was an adjoining room, which really freaks me out. I do not at all care for adjoining rooms – the sound always carries and it seems like there is an upset baby next door to me. This time it was quiet. 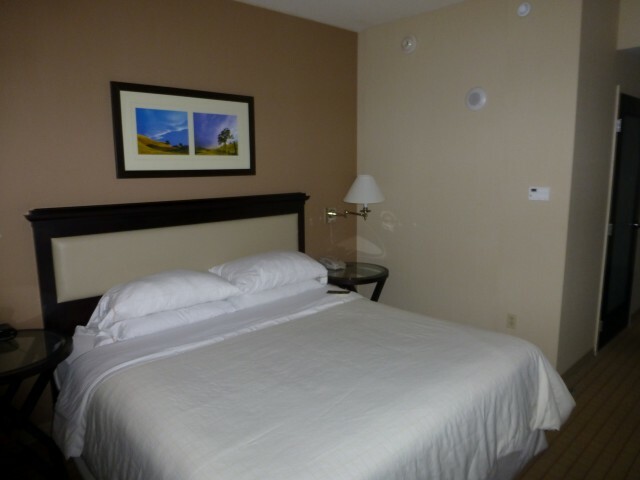 The bed was clean and comfortable – again, unlike the Westin Alexandria. The hotel was very quiet. 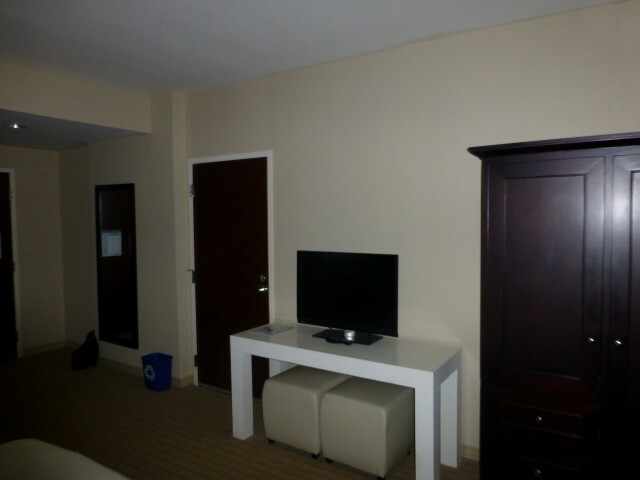 The desk was actually quite useful – it wasn’t crowded with the TV like at my hotel the previous night. 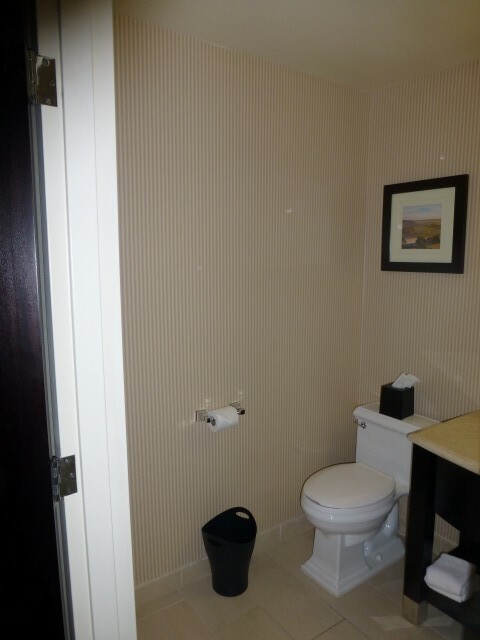 The bathroom was much more sleek and modern than at the Sheraton Park Hotel. There was no tub in the bathroom, just a shower. This is perfectly acceptable to me – I don’t know who takes a bath in a hotel anyway. It just seems gross to me. The bathroom was set up as a traditional residential bathroom – it wasn’t split with the shower and toilet away from the sink. This works just fine to me when traveling alone. I really liked this space much more than the Sheraton Park Anaheim Hotel. It seemed much more clean, sleek and modern. The room was definitely smaller than the Sheraton Park property, but it felt much nicer and actually felt like a place I would enjoy spending time.